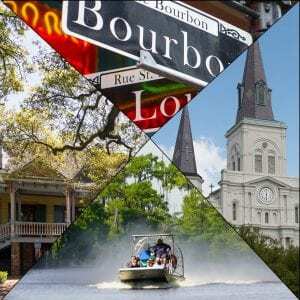 If you are interested in experiencing all that New Orleans has to offer, the City/Katrina Tour and Swamp Small Airboat Tour is the perfect combination tour. Spend an unforgettable 3 hours on our comfortable air conditioned Mini-bus to get an overview of New Orleans. As part of this tour, you will get to the view an area damaged when the Hurricane Katrina broke the levee and swept the residents and their homes away. Next, see the Cajuns of the Bayou living and surviving in harmony with the swamps, and see the swamp come to life with birds, snakes, turtles, fur animals, and of course Gators. The small airboat will venture into places that no other boats dare to go. This tour includes hotel pick-up and ground transportation. We are only 35 minutes from New Orleans yet a world apart. Hold onto your hat! Our Airboat Swamp tour is an exhilarating adventure that consists of part tour and part airboat ride. You will experience the best of both: an educational swamp tour and a high speed airboat ride. You will travel at high speeds on the airboat then slow down and stop for pictures. Along the way, you will get a personal tour by your local Captain. Our airboats have stadium style seating, so that the person in front of you does not obstruct your view. So every airboat seat is great for experiencing the tour and viewing the wildlife. Gators will get close…… real close!!! So close that you will be able to look into those reptilian eyes. Alligators hibernate in the colder months, but our experienced captains know where to look for them. During the winter, you have a 50% chance of seeing a gator. In the warmer months, you WILL see a gator. Every Airboat Tour is unique, and we never know what will be around the next corner. The area toured is a combination of Swamp, Marsh and Lake. The Swamp is such a diverse ecosystem that you may see anything such as a Bald Eagle, a Pelican, an Osprey, or even an Owl. The airboats are driven by a 454 Chevy Engine that will produce speeds of up to 35 miles an hour. They are propelled by a huge fan that will blow air from the back of the boat in excess of 200 miles an hour. The 6-9 passenger airboat is 16′ in length, has bench seats that will sit six to nine total passengers. This airboat is a little faster and can go in some places that the larger airboat cannot reach. These tours are truly a blast! They ride in inches of water and go where traditional boats cannot go! The boats were designed to take you to inaccessible areas of the swamp, places that you cannot reach by foot or car. It is a unique experience. Spend an unforgettable 3 hours on our comfortable air conditioned Mini-bus and get an overview of New Orleans. Experience the history and culture of the Creoles with your licensed tour guide. No trip to New Orleans would be complete without seeing the highlights of our city and the some of the areas affected by Katrina’s flood waters. You will see: Jackson Square, St. Louis Cathedral, the Cabildo and the French Market. You tour guide will give you an overview of the “French Quarter”. The guide will point out areas of interest, so that you can explore them later, at your own pace. You will travel slowly toward City Park and view 100 year old homes along Esplanade Avenue, on the way to the “Dueling Oaks” of New Orleans’ City Park. Visit Saint Louis #3 cemetery, where you will go inside on a short guided tour. Your tour guide will explain how the people of New Orleans bury their dead above ground in re-usable tombs. This tradition was by necessity, not by choice. Drive slowly down St. Charles Avenue, the American side of New Orleans. See some of the homes of the Garden District. You will pass Ann Rice’s home, Governor Claiborne’s Daughters home, circa 1840, the Elms Mansion, and much more. See the diverse Architecture of the American side of New Orleans. As part of this tour, you will get to the view an area damaged when the Hurricane Katrina broke the levee and swept the residents and their homes away. Your ground transportation will arrive starting at 9:30am at the curbside of your hotel. We use our sister company, “Alert Transportation” for the ground transportation service. The driver will go hotel to hotel to pick up our guests. Please allow us up to 30 minutes for the pick up process. The city tour will begin as soon as everyone is aboard and there will be 20 minute break in the middle of the tour for snacks and restroom. . You will spend an unforgettable 3 hours on our comfortable air conditioned Mini-bus and get an overview of New Orleans. Experience the history and culture of the Creoles with your licensed tour guide. No trip to New Orleans would be complete without seeing the highlights of our city and the some of the areas affected by Katrina’s flood waters. Your tour will end by about 1:00 pm, when you will be transferred to our swamp tour vehicle. The driver will take you to the swamp tour dock, where you will arrive by 1:45pm. There is a snack and souvenir shop with candy, chips, microwave sandwiches, muffins and drinks. There is no time for a sit down lunch. On this tour, you will experience the best of both: an educational swamp tour and an exhilarating airboat ride. You will travel at high speeds in the airboat then slow down and stop for pictures. Your Captain will give you a tour of a life time explaining the culture, animals, and the swamps. You may even experience a close encounter with some of the local swamp life. You will return to you hotel around 5:00pm. *The order of the combination tours may change based upon availability and weather.